Past tenants are not forgotten. The Tenant File will preserve their payment history with easy access and the ability to make corrections! When a rental becomes 'VACANT', you can move the tenant information to an 'Inactive File'. There, the Tenant can still be maintained and transactions (such as back rent owed) can be posted. 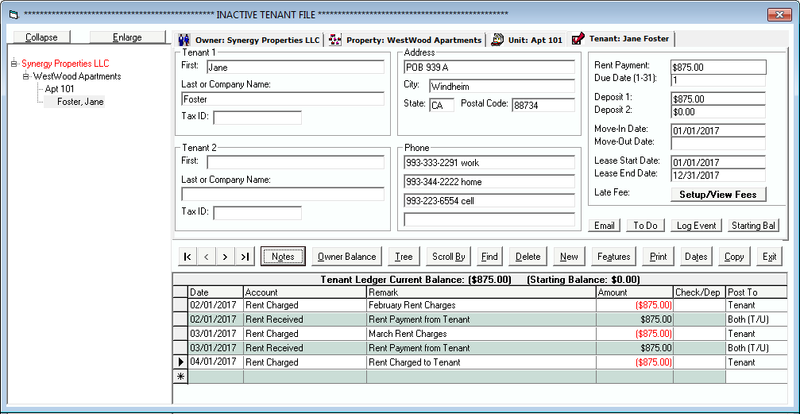 In fact, you can run most of the Tenant Reports in the Inactive File. It is very easy to make a tenant VACANT in seconds and then move a new tenant into the rental property. When you are finished working with the Inactive File, it is easy to switch back to the 'Active File' and continue working. Just a couple of clicks will switch you back and forth from the Active to the Inactive File and back. When you move a Tenant to the Inactive File, the transactions that pertain to the Owner are preserved in the Owner's accounting. So at the end of the year, you will be sure to have all of the accounting needed to file any year-end tax reports or to run statements.